George Groves isn’t going to be the only British fighter hoping that 4th time’s a charm in world title tilts, as Dagenham’s Kevin Mitchell – set to return on December 12th against a TBA opponent – is also looking to work his way back into a similar position. 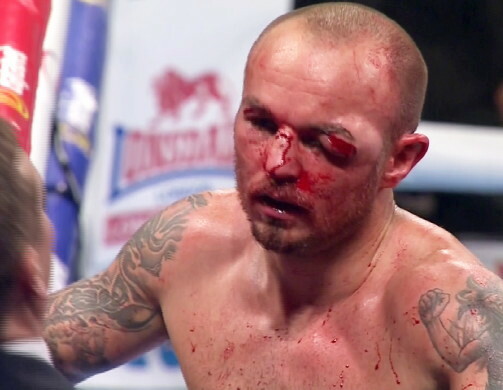 Mitchell was on the losing end of a heroic effort back in May, in a WBC 135 lb title challenge against Venezuelan champion Jorge Linares, dropping “El Nino” in the 5th round of an action packed fight, before incurring a grotesque eye injury (pictured) that impeded his vision, hitting the deck himself in the 10th and being waved off as he rose to his feet, the life drained out of him. It was his 3rd crack at the whip.Prior to that, he was blasted out in 3 rounds in a 2010 interim title challenge to Michael Katsidis, before again getting stopped (tko 4) in Scotland two years later by hometown boy – and then WBO champ, Ricky Burns, before seemingly finding the form of his career leading up to Linares. Mitchell’s promoter Eddie Hearn will be keeping his fingers crossed that another in-house Matchroom fighter – Manchester’s Anthony Crolla – will succeed in his November rematch with Columbian WBA (reg) champion Darleys Perez – a rematch that was ordered following controversial scoring in the first fight – and should that happen, Crolla/Mitchell will be a natural fight to put together next year for the second tier WBA belt. The only major sanctioning body Mitchell holds a ranking inside the top 15 with however, is the WBC, at #4. Any hope he had of an immediate rematch with Linares was scotched when the champion announced he would be returning to his native Venezuela for his next defence, which will be against Ivan Cano on 10th October.